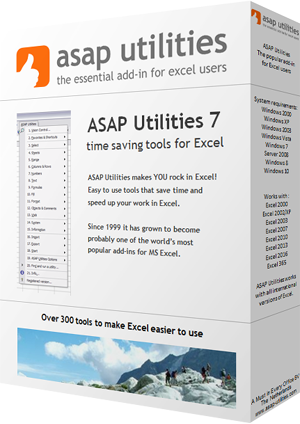 This utility causes Excel to recognize the last used cell in your worksheet correct again. You can use this utility when the end of your worksheet is (far) below or to the right of the actual range that is in use. You can test if this is true by pressing Ctrl+End and Excel takes you to a blank cell below or to the right of the actual data. 1. The end of your worksheet is (far) below or to the right of the actual range that is in use. 2. The scrollbars are very small but you don't have that much data. Microsoft describes this problem in article 244435 as: "Microsoft Excel saves only the part of each worksheet that is in use, meaning the section that contains data or formatting. Sometimes the last cell of a worksheet may be beyond the range of your actual used data. This issue may cause you to have a larger file size than necessary, you may print extra pages, you may receive "Out of Memory" error messages, or you may experience other unusual behavior. Clearing the excess rows and columns to reset the last cell can help to resolve these issues. You can locate the last cell of the active worksheet by pressing CTRL+END". By default this utility can be used with the shortcut Ctrl+Alt+R.